Cylinder 70" x 12' stroke; machinery from West Point Foundry Co., New York, NY; variety of tonnages listed: 453, 1100, 1561, 1683, & 2030. San Juan del Sur, Nicaragua. 1856 Ran the Toronto-Kingston-Ogdensburg route. 1857-58 Owned Detroit & Milwaukee Railroad Co.
1858, Sep 15 Certificate of ownership cancelled by letter from Collector of Customs, Quebec. 1859, Jan 19 Admitted into US Registry, New York City; renamed COATZACOALCOS. 1859 Measured 285'6" x 38' 4" x 14'; 1683 tons. 1858-60 Owned Peter A. Hargous, New York. 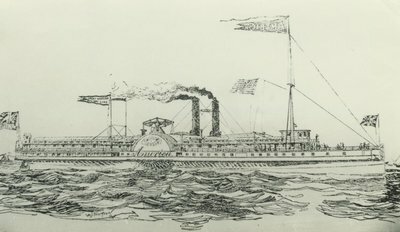 1860-62 Owned Marshall O. Roberts. During Civil War- Charterd by U.S. War Department for use along Atlantic Coast & Gulf of Mexico. 1862, Sep 24 Renamed AMERICA. 1862 Rebuilt, owned People's Line; went to Nicaragua. 1863 Went to Pacific to run San Francisco-Panama Route. 1864-66 Owned Central American Transit Co.; San Francisco-Nicaragua Route. 1866-68 Owned North American Steamship Co.
1868-69 Owned Pacific Mail Steamship Co.; San Franciso-San Diego- Mexican ports.